On Saturday, 11:30 AM 29th June, there will be only one organized tour to The 3rd Tunnel. 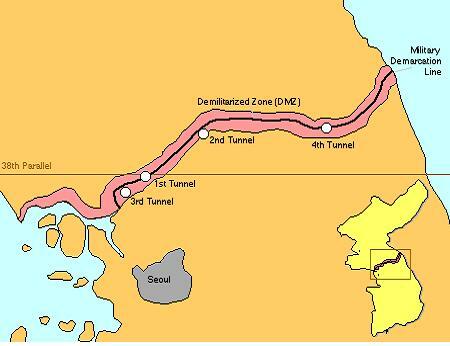 Only 44 kilometers, or less than an hour's drive, from Seoul, the third tunnel was discovered in October 1978. Almost identical in structure to Tunnel, the 1,635meter-long tunnel, 1.95 meters high and 2.1 meters wide, penetrates 435 meters south of the Military Demarcation Line at a point only 4 kilometers south of the Truce Village of Panmunjom. It runs through bedrock at a depth of about 73 meters below ground. Capable of moving a full division per hour, plus their weapons, it is evidently designed for a surprise attack on Seoul. Almost identical with Tunnel? in structure, this tunnel is only 2 kilometers from a key outpost defending the Munsan corridor leading to Seoul. The National Museum of Korea is a place where you can explore the essence of Korean arts and culture. The museum combines Korean history, life, and arts, from hand axes of the Paleolithic period, to celadons of the Goryeo dynasty, to paintings of the Joseon dynasty, to modern photography. The NMK is working hard to make your museum experience more pleasant and enjoyable, by planning a number of exciting upcoming exhibitions, providing docents to give tours in six different languages, and entertaining and educating kids in our Children¡?s Museum. We have many educational programs specifically designed to suit different groups so that information about our numerous relics and works of art is more accessible to everyone. You can also attend fabulous world-class performances and concerts at our Yong Theater, or simply enjoy the afternoon in the tree-filled park which is adjacent to the museum. Changdeokgung Palace was built during the Joseon Dynasty(1395-1910) and has more buildings preserved than any other palace from that period. The palace is designated as Historical Site No.122 and covers a total area of 580,000 square meters, although the main palace grounds which do not include the Secret Gardens cover an area of 120,000 square meters. 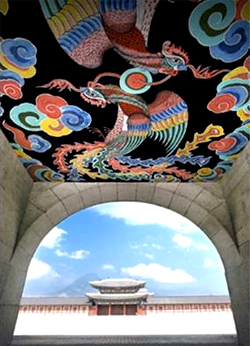 The palace was named Gyeongbokgung, the "Palace Greatly Blessed by Heaven." With Mount Bugaksan to its rear and Mount Namsan in the foreground, the site of Gyeong-bokgung Palace was at the heart of Seoul and, indeed, deemed auspicious according to the traditional practice of geomancy. In front of Gwanghwamun Gate, the main entrance to the palace, ran Yukjo-geori (Street of Six Ministries, today's Sejongno), home to major government offices. 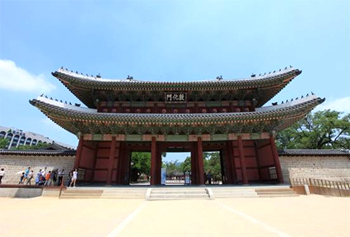 Along the central axis upon which Gwang-hwamun Gate stood was the nucleus of the palace, including the throne hall, reception hall and king's residence. The government ministry district and main buildings of Gyeongbokgung Palace formed the heart of the capital city of Seoul and represented the sovereignty of the Joseon Dynasty. The past foreign residential complex was developed into an open botanical garden, and as the Namsan Park was restored in the areas of Yejang-dong and Hwahyun-dong of Jung-gu and Hannam-dong of Yongsan-gu, it truly changed into a people's park. The Leeum, Samsung Museum of Art opened, after several years of preparation, as an international art and cultural center for the display of both Korean art and world art. The late Hoam Lee Byung-chul, the founder of Samsung, had displayed his beloved collections of Korean national treasures and art pieces in the Ho-Am Art Museum, Ho-Am Gallery, and the Rodin Gallery. Public transportation : Sogang University(Main gate) - Bukhan Mountain Management Corporation(Jeongneung) 110A Bus. The journey from Sogang University to Mt. Bukhan takes about 1 hours. Mt. Bukhan is one of the most popular hiking attractions in Seoul. Averaging 5 million visitors a year, Bukhan Mountain National Park is the "Most Visited National Park per Unit Area" according CNN.